Quilty Folk: A Great Summer Finish! Although I am feeling a bit helpless in the wake of wanting to start so many new projects, my main focus has still been on finishing. Vintage Red was started in 2015 and now, three years later, it is a true blue finish! I zeroed in on this red solid somewhere in my shopping because I've always, always admired that bold, vintage zing that make so many scrappy quilts shine. My quilt top didn't end up being a scrap bin type of quilt, but I tried to incorporate lots of fabrics into it. My motto has always been, the more fabrics the merrier! Nothing like a little applique to make me smile! 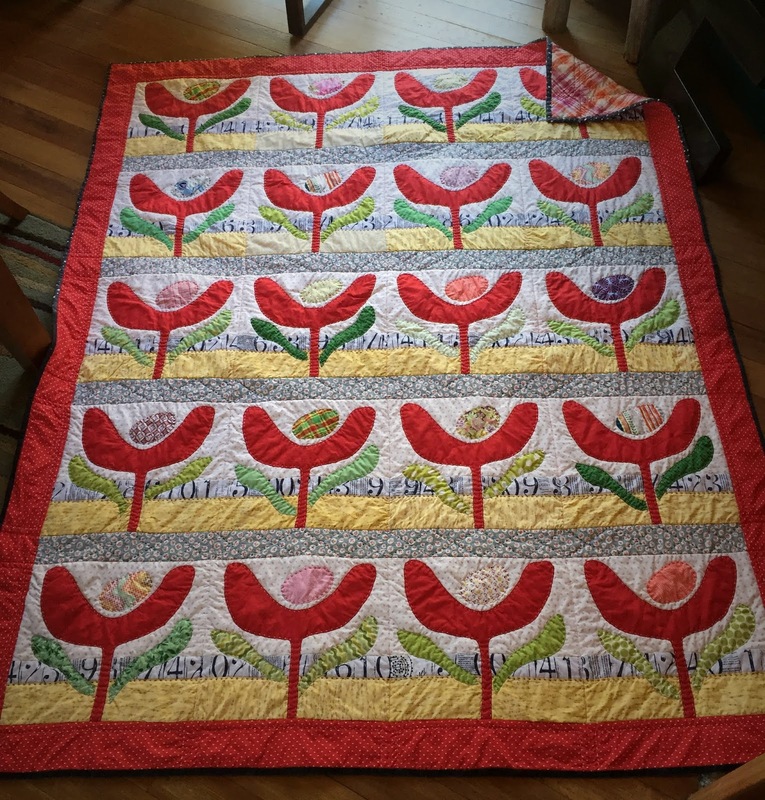 I had hoped to be able to put this quilt into this summer's quilt show, but my stitch-in-the-ditch quilting efforts are very marginal. It's a good thing that I added my usual Perle cotton stitching, or I'd be very upset. As it is, you have to be the picky maker of the quilt to even care much. Isn't if funny how much we see our own mistakes and weaknesses? It's like they are blinking at us in neon yellow! I'm very happy with the fact that this feels very much like an Audrey quilt. 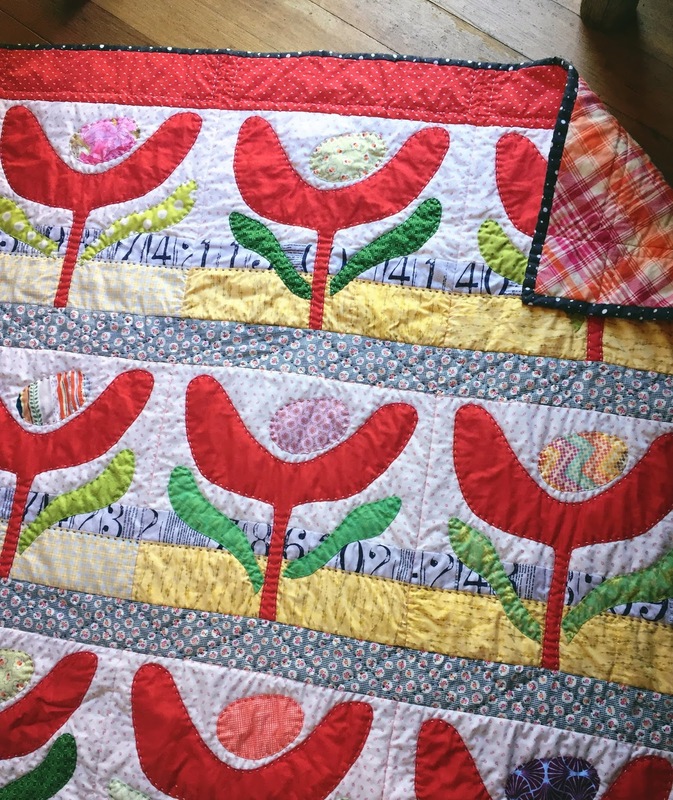 That text fabric, the simple applique flowers, the vintage/mixed modern feel to to it all. Tho I won't subject myself to quilt show perusal, I'm calling it a win. All washed up and crinkly looking, just the way I like them! Congratulations on a grand finish! 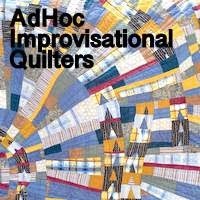 It is a gorgeous quilt, and one I am definitely tempted to copy - it's just that good. I'm calling it a win, too! LUV that plaid backing - it's perfect. It's a wonderfully, perfectly Audrey quilt indeed! btw also love your quilt in the hoop. It's terrific, Audrey! Love it to pieces (and I hope you do just that!). A great finish indeed! Love all the red, it does a real vintage vibe to it! I'm calling it a win too! And I'm also smiling. It's different .... it's vintage .... and I love it! great finish! It is indeed an Audrey quilt - pure joy expressed in fabric! What a beautiful finish! I remember the 'birth' of this quilt and have been with it for every step of its journey. Thank you for sharing your process. I've enjoyed reading your posts on the progress of this quilt. It is adorable and perfect in every detail. Congratulations on a terrific finish! How crisp and lovely! Blessings! 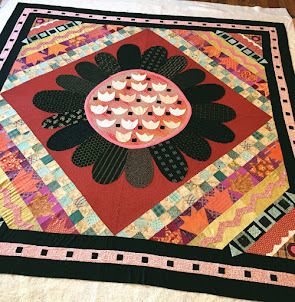 This quilt and your Sunburst make me happy when I see them. Your work is such an inspiration to me! I love how this quilt turned out -- makes me smile, too! Oh, yes. Red was the right choice. 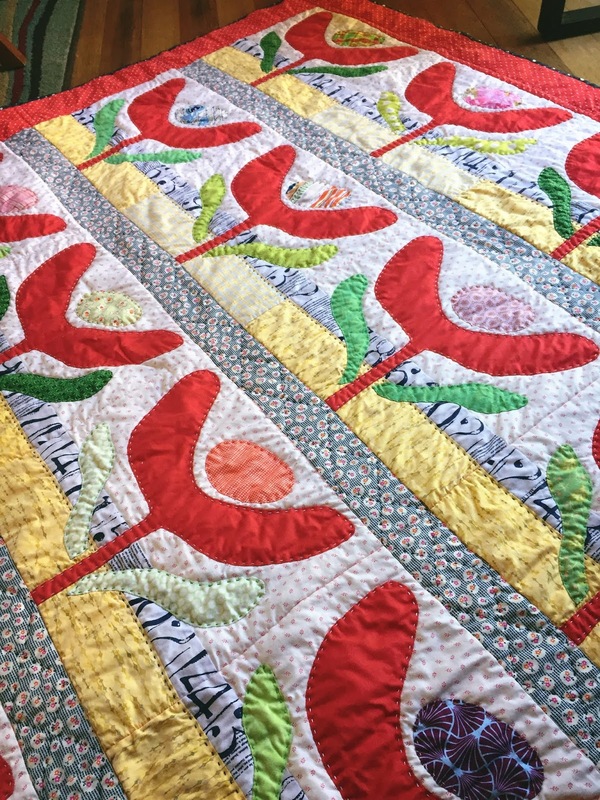 It does make a difference in so many vintage quilts. Beautiful finish. It is really darling! yay for the finish! The red packs a punch. Definitely a win in my book too; it's one of those quilts that just makes me feel like breaking out into an idiotic grin every time I see it. What a great quilt! Congrats on your finish! 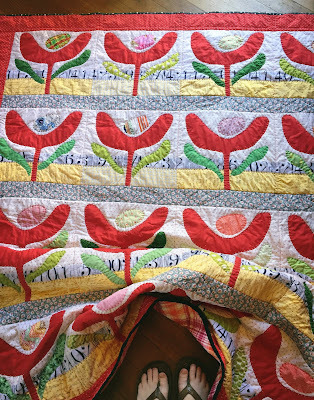 I think this quilt is cute and whimsical, and very much an Audrey quilt! I think the red was perfect! I love it - definitely a winner (no quilt judges needed to decide that). Congrats on a SUPER DUPER finish. Definitely an Audrey quilt - just splendid and love the poppy red flowers. 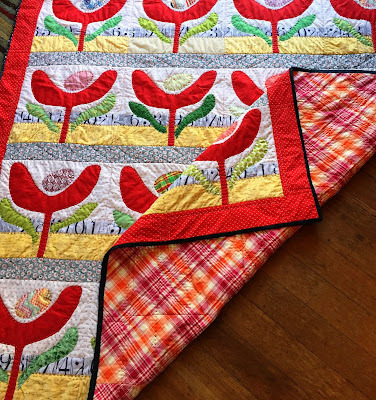 It’s such a happy quilt and your hand stitching makes it folky;). The red can’t be beat! 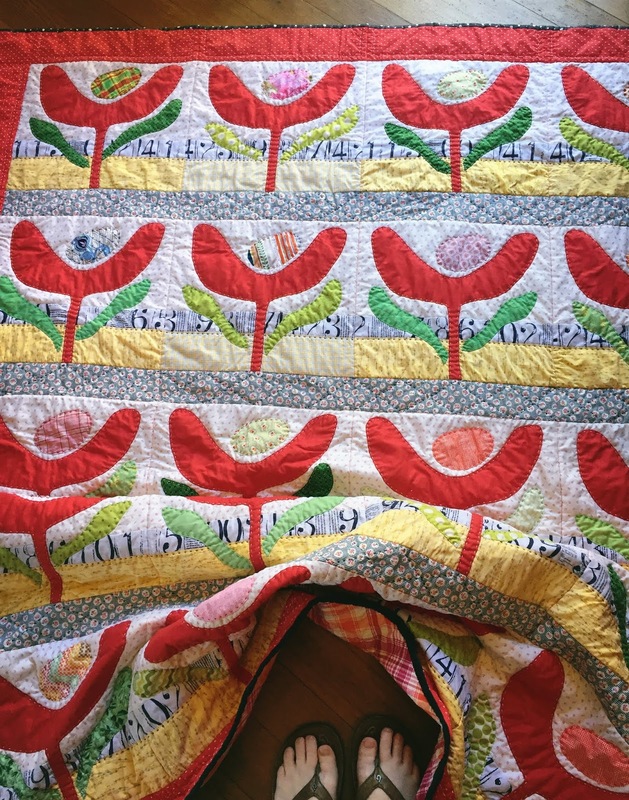 I've always thought of this quilt as Audrey's Easter Egg quilt, still do! I love it! Fabulous finish, and so YOU. 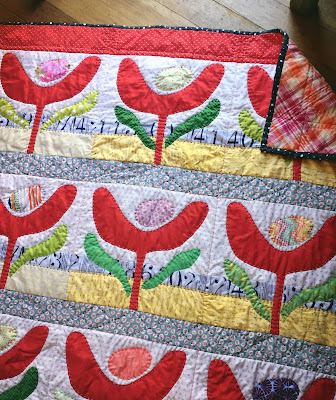 Vintage Red looks wonderful with all her crinkly hand quilted goodness :0) This is one of my favorites of yours! It makes me smile too. I love getting comments and always try to respond via email if possible. If you aren't getting replies back from me, try leaving your email address within the comment. 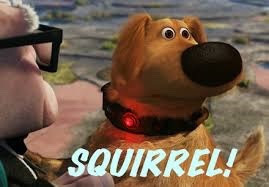 Due to Blogger changes, I've heard that some people aren't able to leave comments here at all. In that case, you can always email me at audkateaster at gmail dot com if you'd like and I'll respond from there. Thanks so much for visiting! Mini Bear Portrait Embroidery – Free Pattern! How small can I go? Quilt/ Sewing News, 'Splash', Bright Modern Sampler Hand Quilting Progress, And Happy Easter! String Play a Reminder to Keep Playing With the Scraps!